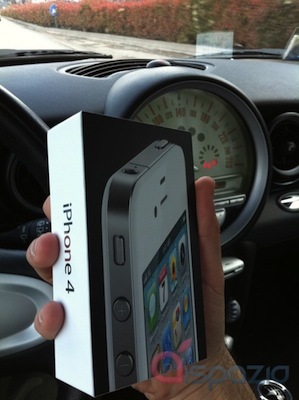 The white iPhone 4 is expected to officially launch tomorrow, but that hasn't stopped several international retailers from selling the units they received ahead of Apple's announcement. 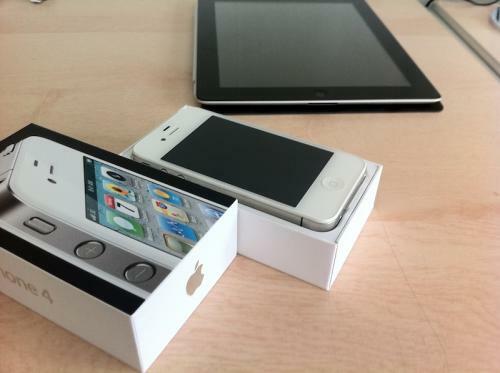 The device, going on sale after a 10-month delay since the original June 2010 unveiling, has been delayed multiple times in the past due to alleged production issues with the white paint, which -- according to many -- caused problems with the camera lens, as well as light leaking from the front panel. 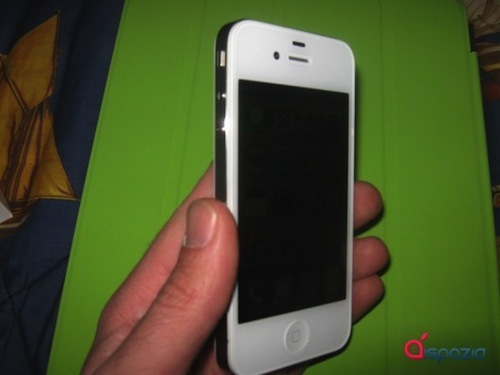 The final version of the white iPhone, as reported last week, introduces a redesigned proximity sensor that has a different shape and doesn't sport the grille of small holes seen in Steve Jobs' on-stage demo last year. While we're still waiting for Apple's official press release about the white iPhone, iSpazio [Google Translation] reports a unit has been already sold in one H3G store in Italy. 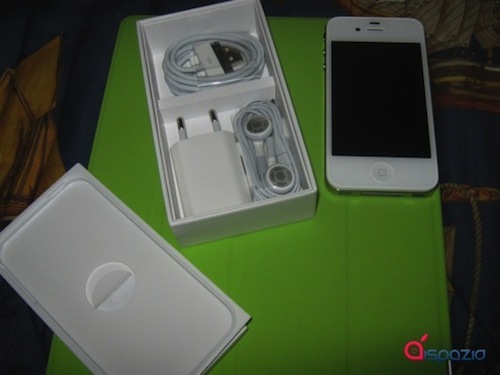 On the other hand, MacRumors says a reader managed to obtain a white iPhone at a Mobistar retail shop in Antwerp, Belgium -- where, apparently, all the available white iPhone units were on sale to customers a day ahead of the rumored launch. You can check out more photos below. 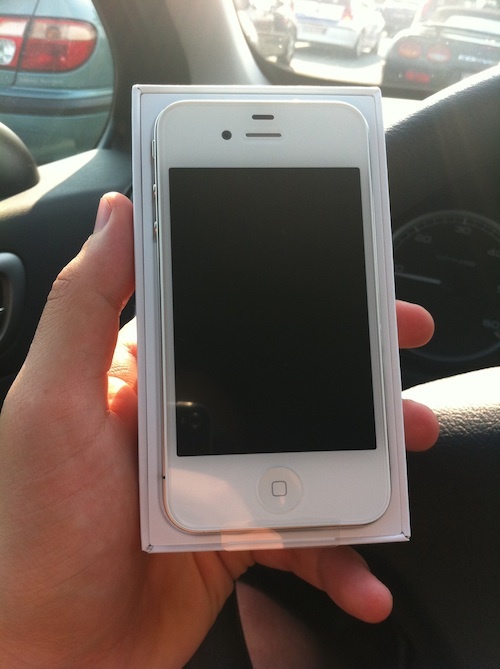 If you've got a white iPhone 4, send us pics. We'd love to hear about antenna and proximity sensor performances. Update: iSpazio updated their post with more photos and an unboxing video of the device. The website also says the proximity sensor works "really well" and claims the signal degradation issues are the same of the black iPhone 4 (this one is a GSM unit). 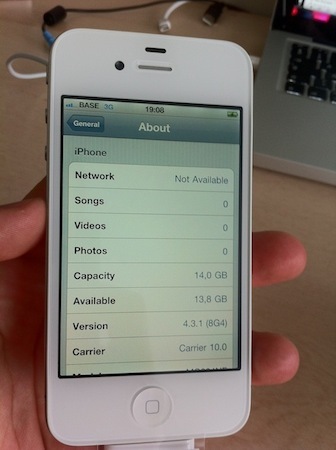 Update #2: MacRumors reports the white iPhone 4 ships with iOS 4.3.1 (build 8G4), released in late March for the GSM iPhone 4.